In 1956, General Electric (GE) constructed the original 161,000 square foot facility, situated on 96 acres in the center of Pinellas County, formally known as Bryan’s Dairy Farm. GE sold the facility to the Atomic Energy Commission (AEC) in June of 1957. In return, GE was awarded a contract to operate the facility for 25 years. The facility became known as the Pinellas Plant. The sole intended use of the facility was to house the engineering, development and manufacturing of components supporting the nation’s nuclear weapons program. The AEC was abolished in the 1970s and the Department of Energy (DOE) assumed responsibility for the nuclear weapons program. Over three decades of operation, the facility’s total square footage was expanded to approximately 750,000 square feet. In 1992, after the end of the Cold War, the DOE formally announced that the Pinellas Plant would be closed in 1997. In that same year, GE announced that they no longer would continue as the prime contractor. The DOE awarded the contract to Martin Marietta. In 1994, Lockheed merged with Martin Marietta and became Lockheed Martin, who continued as the prime contractor. From 1993 through 1995, the DOE and local public and private entities struggled with decisions to either bulldoze the entire site or to redevelop the facility. In January 1995, the DOE chose redevelopment. The Pinellas Plant Community Reuse Organization (CRO) was created with a mission to oversee the transition of the facility. The CRO was the first such organization to be chartered by the DOE and given administrative support by the DOE and the Pinellas County Industry Council (PCIC), a State of Florida chartered organization responsible for the economic development of Pinellas County. At that time, the CRO and DOE entered into a cooperative agreement that provided direct funding from DOE for the CRO’s administrative and programmatic activities. In March 1995, the DOE sold the Pinellas Plant to the Pinellas County Industry Council (PCIC). The sale of the facility included the real property and 50,000 pieces of personal property, which included: analytical laboratory, machine shop, office, and various manufacturing equipment. The name of the facility was changed to the Pinellas Science, Technology and Research (STAR) Center. The PCIC used the personal property as incentive to lure tenants to the STAR Center. Constellation Technology Corporation was the first major tenant to lease space followed closely by Pace Technology, Inc. The DOE remained on-site as a tenant through December 1997 to complete required industrial clean-up activities. When Raytheon Company became the STAR Center’s anchor tenant in August 1998, a successful transition was in sight. Raytheon Company currently leases 76% of the facility’s leasable space and employs approximately 900 people. In July 1999, the PCIC was abolished and Pinellas County Government created the Pinellas County Industrial Development Authority (IDA) and the Economic Development Department to assume economic development responsibilities. The STAR Center currently operates under the IDA, but administratively reports to Pinellas County Board of County Commissioners. In December 2001, the Pinellas STAR Center was re-named the Young – Rainey STAR Center to honor the two Pinellas residents who were most influential in making the STAR Center the success it is today. These two, U.S. Congressman C.W. 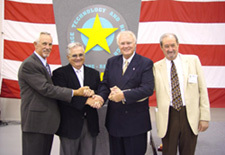 Bill Young (shown center right) and former Chairman of the Pinellas County Board of County Commissioners, the late Charles “Chuck” Rainey (shown center left) provided political support to the facility transition team. Also pictured, are Charles “Ken” Hall (far left), former STAR Center Director and the late William “Bill” Castoro (far right), former Chairman Pinellas Plant CRO. Today, the STAR Center is home to two dozen tenants that employ approximately 1,500 workers. The Center’s total workforce exceeds the workforce employed at the facility before DOE’s plant closing announcement. From 1998 to the present, available acreage has been developed, which has increased the site’s total leasable square footage to approximately 2,622,327 square fee. The facility is self-sufficient and operates on the revenues generated from rent. The facility has never received funding from the County’s general fund. As a federal facility, the facility was not on the County tax rolls. Now, all for-profit companies pay real estate taxes attributed to their space leased at the Center.